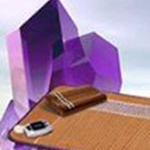 The Bio-Mat™ mx Amethyst, used by thousands of satisfied customers all over the world, enjoy the soothing 3-part synergy of quantum energetics of Infrared Heat Rays, Negative Ion therapy and the healing properties of Amethyst. Want to restore your health? Do you suffer from joint pain and stiffness? Fibromyalgia? Do you have back or neck pain due to auto accident or work-related injury? Are you looking to burn calories and control your weight? Want to reduce stress and fatigue? Learn about the mat why it works and how it works. Participants get a chance to experience a Free mini session. Detox the Easy Way- Webinar coming soon! Please let me know if you plan on attending so I can reserve your spot for you, Call 416-283-4747 or 416-399-2329 Local North America. 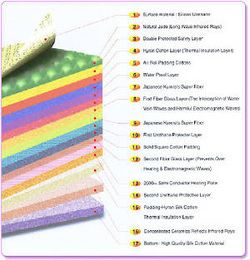 Order your Amethyst Biomat today. Get a $100 Professional discount with copy of license. The gentle warmth of your Bio-Mat™ Amethyst gives you an overall massaging effect, soothing jangled nerves and knotted muscles while healing and cleansing your body. You’ll feel rejuvenated and renewed, restored in body and mind. Already accepted by many insurance companies such as Kaiser and State Farm, ask your doctor about insurance reimbursement.The Bio-Mat™ mx Amethyst is a high-tech Negative Ion and Infrared Ray treatment system that emits many negative Ions and Far Infrared Rays, which contribute to a healthy life. Although specifically designed for clinical use, it can function in the home or care facility. The Bio-Mat™ mx system is an advanced and effective product developed by a highly skilled group of scientists, medical professionals and engineers. Press Release: 7 October 1991 The 1991 Nobel Prize in Physiology or Medicine. The Nobel Assembly at the Karolinska Institute. Far Infrared Ray’s deep heat raises your body temperature, inducing an artificial “fever”, your body’s immune system is strengthened. 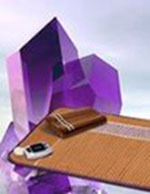 The Bio-Mat Amethyst increases blood circulation and strengthens the Cardiovascular System. As your body increases sweat production to cool itself, your heart works harder pumping blood at a greater rate to boost circulation. The profuse sweating achieved after just a few minutes on the Bio-Mat Amethyst carries off deeply imbedded impurities and dead skin cells, leaving the skin glowing and immaculately clean. Daily sweating can help detoxify your body as it rids itself of an accumulation of potentially carcinogenic heavy metals, as well as alcohol, nicotine, sodium, sulfuric acid and cholesterol. According to a Journal of the American Medical Association report, in a single Infrared Ray sauna session, you may burn as many calories as you would rowing or jogging for 30 minutes, so you lose weight not just water. Increased circulation draws your skin’s own natural nutrients to the surface. Your overall health and resistance to disease is increased. Infrared Ray heat therapy is widely used to treat patients suffering from many forms of arthritis. In addition, it has been proved effective in the treatment of sprains, neuralgia, bursitis, muscle spasms, joint stiffness, and many other muscular-skeletal ailments. The deep heat of the Bio-Mat Amethyst helps peripheral blood vessels dilate, bringing relief and healing to muscle and soft tissue injuries. Increased blood circulation carries off metabolic waste products and delivers oxygen-rich blood to oxygen-depleted muscles, so they recover faster. Unlike an electric blanket, the pad does not get hot when it is turned on. However, if you lie down on it, it warms the inside of your body and the part of the pad making contact with your skin gets warm. When any part of the pad gets higher than the selected temperature, the sheet current is cut off by thermal sensors distributed throughout the pad. It comes with an external control box where the AC is converted to DC, and you can adjust the desired temperature of the pad. The Bio-Mat is a power heated mattress pad. An electric blanket or electric heating pad uses electric current which runs through it which is not healthy. The Bio-Mat Amethyst controller has EMI or Electromagnetic Interception which blocks the harmful EMF, as well as a Timer so you can set it to turn off in 2, 4, 8, or 12 hours settings. Enjoy the soothing Infrared Heat Rays and Negative Ion therapy recommended by Healthcare professionals in the privacy of your home. The quantum energetics are cumulative and profound and benefit the body, mind and spirit.